Cars parked in front of the Casa de Gobernacion in Penonome, blocking other cars in. Photo by Eric Jackson. We could get into some interesting, and perhaps insulting, comparative political culture analyses of what gets declared a human right. Here in Panama, it doesn’t include carrying a fully loaded and fully automatic assault rifle into a hospital emergency room. But back in September our National Assembly did pass a law declaring that drivers have a right to a parking space. That is, for example, that people with business to do at Punta Pacifica’s gleaming palaces that were built without anything close to sufficient parking get to park for free at the ample lots built for the MultiPlaza mall, which is expanding and hopes to eventually need all of that space. It’s not just a Panama City issue, though. On a stroll through downtown Penonome, a driver honked to get me off the sidewalk next to the Catholic Church. His intention was to park on the sidewalk in front of the gate by which people and their cars get in and out of the church parking lot. 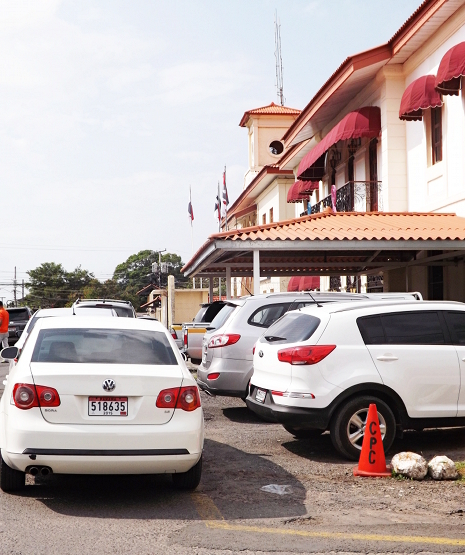 Then around the corner was the scene shown above, in which cars parked in front of the Cocle provincial Casa de Gobernacion block in other cars parked in the designated spaces. President Varela vetoed the bit about a right to a parking space, with the support of the Chamber of Commerce arguing that it violates the property rights of those who own the lots on which people would park. But the legislators, not wanting to be known as evil oppressors who keep their constituents from parking their cars in convenient places, overrode the veto. Is it political suicide to suggest that Panama’s urban areas have too many cars, that dealing with the problem — or not dealing with it — carries costs and that it’s drivers who ought to bear that cost? Maybe not. Most Panamanians ride the buses, and in October, after his lost argument with the National Assembly, polls suggested that Varela’s popularity jumped several points. The metro area public in general expresses annoyance with all the congestion, more than half of those interviewed by the Dichter & Neira polling firm opining that the Transito Police are not doing much to solve the problem. The legislative session ends on October 31, at which time the docket gets erased, to be started over in the next session, which begins next March. Thus we see all manner of demagoguery, most of which will be neither debated nor passed. Most Panamanians are not fooled by the game.